In July I hosted a workshop at Gdynia Design Days' conference Design Talks Business, "Business fit for our grandchildren and the planet! Tools for transformation". 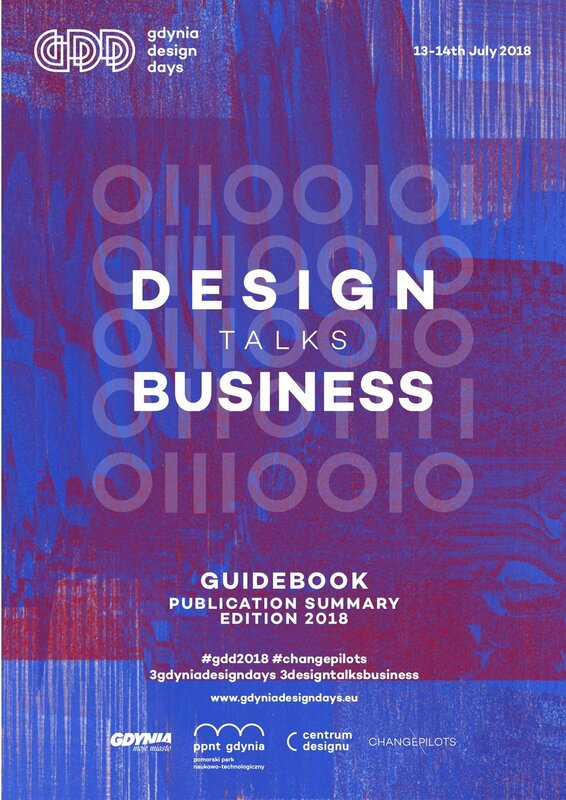 Quite recently Design Talks Business released a guidebook packed with advice and learnings from many of the speakers and workshop hosts. The text below is my contribution to the guidebook. Here's a short summary of the whole conference. I am writing this, not for the faint of heart. But for those who want to bring about change. For those who see social justice, equality, climate change mitigation, and ecosystem protection, not as a threat but as a battery of opportunities — business opportunities. Our society is changing at an unprecedented speed. Humanity is more connected than ever, and despite what we are told over and over again, safer and more prosperous than ever before. Of course, we still face enormous problems, catastrophes, and even atrocities being committed among us. There are all the reasons in the world to talk openly about humanity’s challenges in the age of Anthropocene. And yet, at the same time, we’re doing really well. Child mortality, the number of babies per woman and illiteracy are at all times low, just to mention a few examples. Moreover, vaccination rates, the number of children who attend school and women’s education levels, are at all times high. These numbers may seem isolated and unrelated at a first glance. But looking deeper at what it takes of a society to e.g. reduce child mortality, indicates countries, cities and communities that have a newly acquired ability to provide clean water, sanitation, healthcare, a safe childhood without violence, and much more. Furthermore, humanity seems to be leaving some of the need to solve problems with violence. Are we even moving into an era where democracy, human rights, tolerance and dialogue are becoming the core of the human experience? In any case, humanity is making enormous progress — fast. Everything. In every sector of society and in every profession there is enormous untapped potential to contribute to betterment and change. Agenda 2030 and the global sustainability goals are a tone-setting example of this. Business along with other sectors are waking up to a new reality, realising that, “if you are not part of creating solutions for sustainable development — you are part of the problem”. Businesses are taking on the challenge of transforming their ventures from conventional “business as usual” to “business for good” while still making money. They are discovering that paying attention to social and environmental impact alongside financial longevity is key to building a reputation, reaching out to new audiences and helping to secure business and the planet for future generations. What does this really mean businesses? As you are reading this, hopefully, you are asking yourself, “Am I part of the problem or the solution?”. We are all children of our time, most of us move about the planet, creating a harmful carbon footprint without even reflecting on it. Are you nodding in acknowledgement and thinking something along the lines of, “Yes, I might be part of the problem — but I would much rather be part of creating solutions for sustainable development”? This is the divide between the faint of heart and the brave change makers. And reading this far, you might just have proven to be part of the latter group. The change makers. With this realisation, you can confidently start your journey towards contributing to “business for good”. To support you along the way, there is three guiding question that can help you kickstart or refine your business’ contribution to sustainable development. What kind of life in my community and on this planet do I want my business to contribute to? Hopefully, you want your business, throughout all phases of its life-cycle to contribute to prosperity in the community and for the planet. The life-cycle of a product includes all social, environmental and financial undertakings, from the initial research and development to material extraction, throughout manufacturing and production, storage, transportation, utilisation, disposal or recycling. The life-cycle of a service obviously looks different, but can sometimes do even more harm than a product since it induces a significant carbon footprint through e.g. travelling. Remember that a truly responsible business recognises that externalisation of costs is a violation of the community and the planet, and willingly absorbs all costs it causes. How can I turn my business Zero Waste? Zero Waste is a radical and powerful tool since it indicates exactly how much waste there is room for in a product or service life-cycle. How can you reinvent your business in order to produce ZERO waste? Familiarise yourself with Zero Waste (Refuse, Reduce, Reuse, Repair, Return, Rot, Recycle), and related terms such as life-cycle analysis and cradle-to-cradle. How can I measure my social and environmental impact alongside financial key indicators, and tell the world of the progress I am making? Identify what your business would risk by not engaging, and use sustainable development as a force for innovation. Do good and measure your impact — or even, be the best, lead the market, and tell the world of your progress. There is an ever-growing number of conscious consumers interested in ethical and environmentally responsible products and services. However, steer clear of “greenwashing”, communicating that your business is more sustainable than what it is. Consumers will notice and drag your business through the social media mud. Take some time answering the questions above. Then take a deep breath. The adventure for you, brave change maker, is about to commence. Let us create change together.